The Dominican Republic is a colorful tapestry of Spanish, French, and African influences woven by a rich and storied history. Christopher Columbus described this lush land as "a beautiful island paradise with high forested mountains and large river valleys". This statement is still as true today as it was in 1492. 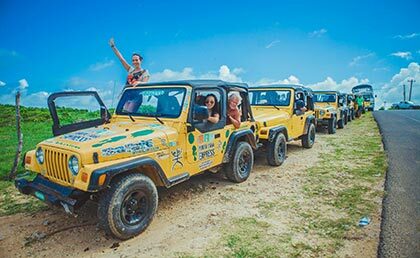 In addition to the comforts of sun, sea, and sand, the Dominican Republic offers an exciting and unique cultural experience that will captivate your senses. Beaches are widely celebrated as being among the world's best, and for good reason. 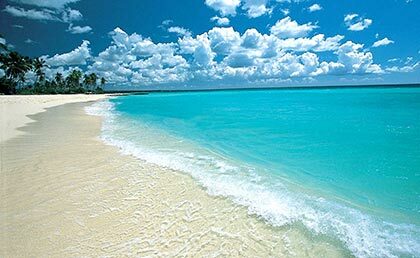 Here, more than 1,000 miles of white sand is gently lapped by warm waters so clear and blue one has to see to believe. Depending on location, the beaches offer a gentle lullaby for an Oceanside nap or enough wind to keep a Technicolor kite board adrift. Super fine white sand sprinkled with coconut palm trees line the east coast while golden sand defines the beaches of the north coast. Adding a third color to the palette are the grey sand playas of Barahona in the west. Some of these areas are populated with resorts featuring a full array of water sports, food vendors, people watching and other activities. While others take visitors to another world of pristine tranquility with peaceful, uninhabited beaches. Here, the only intrusions are a towering coconut palm and the swaying breeze. 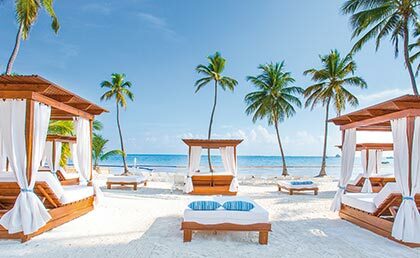 The Dominican Republic has one of the most expansive coastlines in the Caribbean with more than 800 miles of diverse ecological environments ranging from desert to tropical rainforest. Regardless of where visitors choose to drop anchor, grand mountain backdrops, white sand beaches and turquoise blue waters are sure to meet them. Over the next two years, the Dominican Republic is more than doubling the number of full-service marinas, some with unique features never before available in the Caribbean. These additions are more than new places to dock ship. Several of these marinas are being opened in parts of the country that never before could service large vessels. 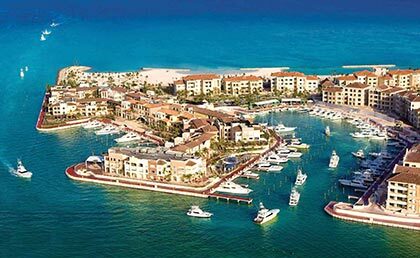 At present time, the Dominican Republic is able to dock yachts to 150 feet in length overall (LOA). However, the many marinas in development will allow the country to handle any yacht size up to 250 feet LOA. 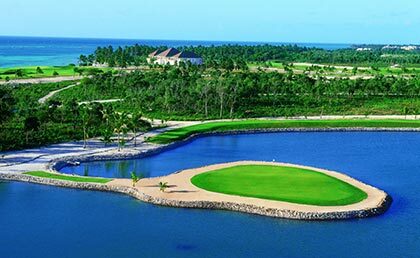 In fact, Cap Cana Harbor and Marina will be the largest world-class mega-yacht marina in the Caribbean with capabilities of hosting over 500 yachts. 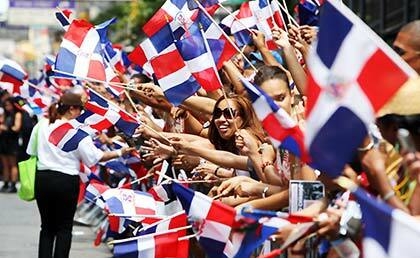 History with a glance at the Dominican calendar, one sees month after month awash with holidays patriotic in nature. While some believe this stems from the Dominican people's love of a good fiesta, it's actually the country's long and storied history that is responsible. Holidays such as Juan Pablo Duarte's birthday and Restoration Day all point to the turbulent past of this now tranquil tropical getaway. The Dominican Republic was discovered on December 5, 1492, by Christopher Columbus during his first voyage to the New World. At that time the island of Hispaniola (as Columbus named it) was called "Quisqueya" by the Taino Indians who occupied the land. With a population estimated around 600,000, the Tainos (meaning "the good") were peaceful and hospitable to Columbus and his crew of Spaniards. Columbus himself grew a particular fondness for Hispaniola, describing it in his journal as "a beautiful island paradise with high forested mountains and large river valleys." Whether it's little, minor or major league, baseball has been dominating the U.S. sports industry for decades. However, before legends like Babe Ruth and Jackie Robinson appeared in the spotlight, the Caribbean was flooded with pro-level players batting, throwing, catching and running the bases. Back in 1866, American sailors stationed on the island of Cuba taught natives the rules of the game of baseball. Following the Ten Years' War (also known as the Big War) in Cuba, baseball migrated to the Dominican Republic along with Cubans who were fleeing their country. Quickly nicknamed "beisbol" by the Dominican people, the sport was rapidly learned and became a passion. Today, traveling from one side of the country to the other presents national scores of baseball fields and stadiums, attesting to the Dominicans' love for the game. Some of the famous Dominican baseball players in USA : Pedro and Ramon Martinez, Juan Marichal, Moises, Jesus, Mateo and Felipe Alou, Manny Mota, Manny Ramirez, David Ortiz (big pappy), George Bell, Juan Samuel, The great Sammy Sossa, Alex Rodriguez, Tony (Cabeza) Fernandez, Ricardo Carty, Vladimir Guerrero, Albert Pujols, Manuel Tejada, Henry Rodriguez, Alfredo Griffin and so more than 1000 players. The largest producer of cigars in the world, the Dominican Republic is known to enthusiasts around the globe as "Cigar Country." While Cubans are often more recognizable, Dominican varieties are of a far superior quality overall. With products that cover a wide variety of aromas, colors and price tags, visitors won't be able to resist sampling and returning home with a local stogie. Providing the ideal growing environment, the majority of cigars are produced in the central island's Santiago and Cibao Valley regions. In fact, the country boasts more than 600,000 acres of tobacco plants. It is because of Dominicans' careful cultivation and management of tobacco crops that the country is able to produce cigars that are truly distinctive and of impeccable quality. Dominican Cusine Dominican Republic cuisine is predominantly made up of a combination of Spanish, Taino and African influences over the last few centuries. Typical cuisine is quite similar to what can be found in other Latin American countries but, many of the names of dishes are different. Breakfast usually consists of eggs and mang (mashed, boiled plantain). For heartier versions, these are accompanied by deep-fried meat (typically Dominican salami) and/or cheese. Similar to Spain, lunch is generally the largest and most important meal of the day. Lunch usually consists of some type of meat (chicken, pork or fish), rice and beans, and a side portion of salad. "La Bandera" (literally, The Flag), the most popular lunch dish, consists of broiled chicken, white rice and red beans. Typical Dominican cuisine usually accommodates all four food groups, incorporating meat or seafood; rice, potatoes or plantains; and is accompanied by some other type of vegetable or salad. However, meals usually heavily favor meats and starches, less dairy products, and little to no vegetables. Many dishes are made with sofrito, which is a mix of local herbs and spices sauted to bring out all of the dish's flavors. Throughout the south-central coast, bulgur, or whole wheat, is a main ingredient in quipes or tipili (bulgur salad). Other favorite Dominican dishes include chicharrn, yucca, casave, and pastelitos (empanadas), batata, pasteles en hoja, chimichurris, platanos maduros and tostones. Some treats Dominicans enjoy are arroz con dulce (or arroz con leche), bizcocho dominicano (lit. Dominican cake), habichuelas con dulce (sweet creamed beans), flan, fro fro (snow cones), dulce de leche, and caa (sugarcane). The beverages Dominicans enjoy include Morir Soando, rum, beer, Mama Juana, batida (smoothie), ponche, mab, and coffee. Musically, the Dominican Republic is known for the creation of Merengue music, a type of lively, fast-paced rhythm and dance music consisting of a tempo of about 120 to 160 beats per minute (it varies wildly) based on musical elements like drums, brass, and chorded instruments, as well as some elements unique to the music style of the DR, such as the marimba. Its syncopated beats use Latin percussion, brass instruments, bass, and piano or keyboard. Not known for social content in its commercial form (Merengue Tpico or Perico Ripiao is very socially charged), it is primarily a dancehall music that was declared the national music during the Trujillo regime. Well-known merengue singers include Juan Luis Guerra, Fernando Villalona, Eddy Herrera, Sergio Vargas, Too Rosario, Johnny Ventura, and Milly Quezada. Merengue became popular mostly on the east coast of the United States during the 1980s and 90s, when many Puerto Rican groups such as Elvis Crespo were produced by Dominican bandleaders and writers living in the US territory. The emergence of Bachata-Merengue along with a larger number of Dominicans living among other Latino groups (particularly Cubans and Puerto Ricans in New York, New Jersey, and Florida) contributed to the music's growth in popularity. Bachata, a form of music and dance that originated in the countryside and rural marginal neighborhoods of the Dominican Republic, has become quite popular in recent years. Its subjects are often romantic; especially prevalent are tales of heartbreak and sadness. In fact, the original term used to name the genre was "amargue" ("bitterness," or "bitter music"), until the rather ambiguous (and mood-neutral) term bachata became popular. Bachata grew out of, and is still closely related to, the pan-Latin American romantic style called bolero. Over time, it has been influenced by merengue and by a variety of Latin American guitar styles. Another genre of music that has been growing in popularity in recent years in the Dominican Republic is Dominican Rap, or "Rap del Patio" (Street Rap). This genre can be described as similar to American Hip Hop or Rap music rapped in Spanish with a thick Dominican accent, with subject matter that varies from social problems to money to fame, similarly to its U.S. counterpart. It must be noted, however, that it differs from Reggaeton in the fact that the beats do not use the familiar Dem Bow rhythm of Reggaeton, instead using beats similar to American rap. Singing is usually not a part of Rap del Patio; and the themes of Rap del Patio are usually more street-oriented rather than the club-themed Reggaeton. Notable artists are Lapiz Conciente, R-1, Vakero, Joa and Toxic Crow. Merengue The country's national dance, traditional meringue groups are comprised of a three-piece band including a melodeon (accordion-like instrument), a guira (a scraped percussion piece) and a tambora (double-headed drum); however, it has expanded to incorporate other instruments such as the saxophone, trumpets, violin, flute and piano. Its tempo is characterized by an aggressive beat, requiring its dancers to swing their hips in rapid, fluid motions and make sure their feet follow suit. Early meringue's lyrics were based on sexual encounters and other socially taboo subjects, thus preventing it from becoming widely accepted. Today, meringue's lyrics cover more general topics including politics and current events. Its music has become so popular, in fact, that it is honored with two regional festivals each year. 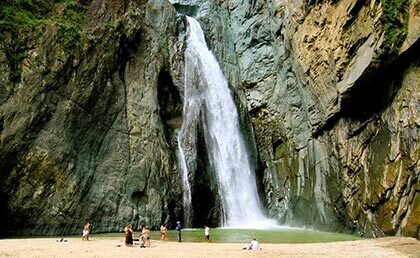 Dominicans are cheerful and hospitable people, known for their cordial attitude towards their visitors. 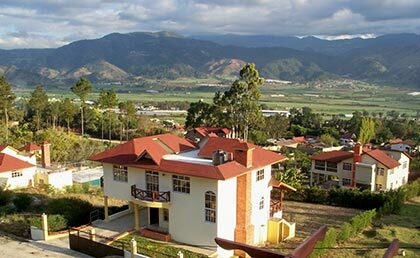 Book Dominican Republic hotels now !